COMPANY PROFILE Flex Ltd is a provider of Sketch-to-Scale services. It provides designing, manufacturing and supply chain services of packaged consumer electronics and industrial products to various industries and end-markets. Flex is one of the world’s largest contract electronics manufacturing companies, providing comprehensive electronics design, manufacturing, and product management services to global electronics and technology companies. Flex operates in four segments: Communications & Enterprise Compute, Consumer Technologies Group, Industrial & Emerging Industries, and High Reliability Solutions. At the price of USD14.37 as at 16 Jun 2018, Flex Ltd is trading at a Price to Book Ratio of 2.4 times current book value. 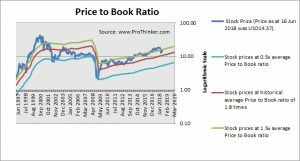 This is a 36% premium to its historical average Price to Book Ratio of 1.8 times.